This is the first solo show after moving the gallery to this address. It is sound installation of Rolf Julius, Germany sound artist. 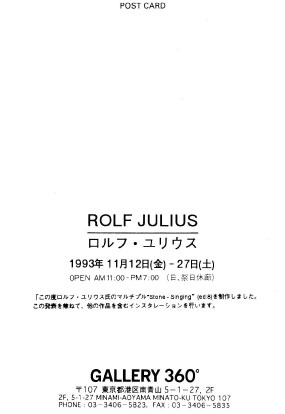 We published Julius' first sound multiple "STONE SINGING" on the occasion of the exhibition. Sensitive and simple sound art by Julius is made from stone and iron, combined with speaker. 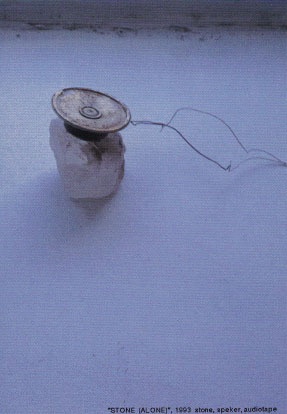 He has been interested in Zen and making "Small Music" with the idea of not against nature and small insist. This multiple was made from Japanese whetstone and speaker. You will enjoy song of stone as he told "Music exists freely like a wind. I try to be a part of nature".